In the spirit of catching up on spinning-related things for the blog, I figured it was finally time to tell you about the class class I took way back when at Rhinebeck called For The Love of Longwools. Longwool sheep, as you may or may not know, are breeds that produce wool with a very long staple length, relatively little crimp/elasticity, and usually a lot of luster/shine. They are basically the opposite of the very common fine wool Merino, which has tons of bounce and softness, a short staple length, and no shine. This means that longwools can and often should be spun into yarns that will look and act differently than those made with Merino wool. The class was taught by Beth Smith who owns The Spinning Loft in Michigan. Her shop carries all sorts of spinning materials, including raw fleeces if you wish to give washing your own a try (someday). The bulk of the class was mostly just trying out 5 different breeds of longwools. For 3 of them, fiber was provided as washed locks, so we learned to comb them and use a diz to create fluffy top (see Sara’s blog post on A Year At The Wheel for a great photo tutorial on the process). For the other 2, we received commercially processed top to play with. I learned how to Andean ply from a fellow classmate, which allowed me to use my hand to wrap some yarn in such a way that I could make 2-ply samples with no lazy kate, bobbins, or toilet paper rolls involved (that link shows a slightly different process than I learned but is the same idea). It was a great experience to be surrounded by so many spinners with so much love for their craft and it’s definitely something I’ll do again the next time I get to go to a festival. Now, onto the spinning! In these photos, the left image has the washed locks in the top left, the combed fiber in the top right, and the 2-ply yarn is in front. The right image shows a closeup of the yarn. These yarns are small samples fresh off the spindle, not washed and set like you’d usually do with finishing. English Leicester was probably my least favorite of the wools we tried. It was the brightest white, which probably means it would dye wonderfully, but it also had the wiriest feel to it, much more hair-like than wool-like. The locks do have a very cool wave to them, though, and it was easy to comb and spin into a shiny yarn. Even though Coopworth wool was also more on the hair-like side of things, I liked it better. Perhaps it’s because the locks had a tighter crimp, which made them act a bit woolier during combing and spinning? A sample of Coopworth came with my Golding spindle when I got it, which I proceeded to turn into a thick, wiry yarn, but I think I could do much better with it now that I know more about drafting and the right amount of twist. The finished yarn spun up very easily and has a decent amount of bounce to it. It is also very, very strong– you wouldn’t want to try to break this one by hand. Of all the longwools we tried, the Blue Faced Leicester felt the softest and wooliest. It even had a bit of a lanolin feel to it in the washed locks, which had the most crimp of them all. I love those little ringlets! Possibly because it was the least foreign to me, I liked the way the BFL spun up the best. The finished yarn is soft and lush-feeling but still has a great shine and when knit up would probably drape nicely. What’s also nice about BFL is that it’s one of the most widely available single-breed yarns on the market besides Merino, so you could try knitting with it fairly easily. For this and the next breed, we received the wool as commercially prepared top, not locks, so we didn’t comb it ourselves. The Romney had a very long staple length with very little crimp at all, the fibers all seemed straight and relaxed. I didn’t really get very strong impressions from this wool, honestly. The resulting yarn is a bit course and does not have a lot of bounce nor does it have a lot of shine, it feels kind of in between on everything. I know a lot of people really like Romney, so this could have had a lot to do with its preparation or with the way I spun it (from the fold) and it might like it better to be worsted spun or carded into roving and then woolen spun. I’ll have to experiment because I now have plenty of Romney to play with in my fiber stash. AmIright?? Look at those luscious locks! 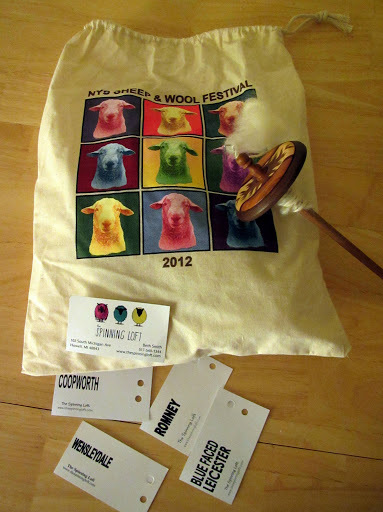 This entry was posted in festivals, giveaway, sheep, spinning by shoelaceswitcher. Bookmark the permalink. Oh such a fun post! I really enjoyed getting to see how each of these fibers compare! Now which fiber are you going to spin up from your stash next? Has this little experiment made you want to work with one in particular? My answer to my favorite breed to work with might seem unusual, I really enjoy Corriedale. I love your posts like this! I learn so much about fiber from your blog. It will be fun to see where this new knowledge takes you! I've heard that Corriedale is a good fiber to start spinning with, but haven't tried it. I think Romney might be next on my list, I want to give it another chance. Oooo. That is a tough one. I had worked at a mill, so I was able to take mill ends and spin them. I had access to a lot of rare breeds. (California Red, Jacobs, Cotswold) I've found that I like the results BFL and alpaca give me. But I've also spun up Romney, and that was probably one of the easier ones I've spun. I do know what my least favorite was. Silk. Spinning the singles was easy, but it was a nightmare trying to ply it. I overplied it despite my best efforts. Thanks for sharing your thoughts on spinning up different breeds. It was a great read. Absolutely loved this post! (And am so incredibly flattered by your link to my blog!) 🙂 I took this exact same class at SOAR 2010, and had such a great time. Isn't Beth such a great teacher? As for my favorite fiber… wow. This is tricky! *ponders* For spinning enjoyment, I think I'm going to have to go with BFL. For finished yarn, Merino and Rambouillet are always such a joy to knit with, even if I sometimes curse the shorter staple length.